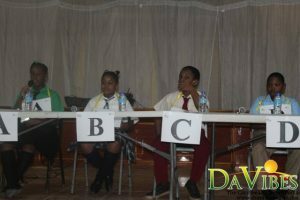 Ciana Joseph representing Goodwill Primary School is has emerged as the winner in the 2018 Central Cooperative Credit Union Spelling Bee competition. Joseph emerged as winner after an intense extended tie breaker round with Khanye Robin of the Ebenezer SDA Primary School. Robin placed second, while third place was won by Kenele Baron representing the St. John’s Catholic Primary School. Fourth place was captured by Camille Casimir representing the Dublanc Primary School. While speaking with Dominica Vibes News after her win, Joseph stated that she is elated to have won and that her practice had paid off. “First of all I feel extremely elated that I won the spelling competition, because I practiced and practiced with my parents and teachers and my principal. At first I was nervous but then I got comfortable and I was really happy when I was announced as the spelling bee winner,” Joseph told Vibes. The students were given forty words each to spell during the Spelling Bee Competition. The competition was held earlier today at the Dominica Public Service Union.